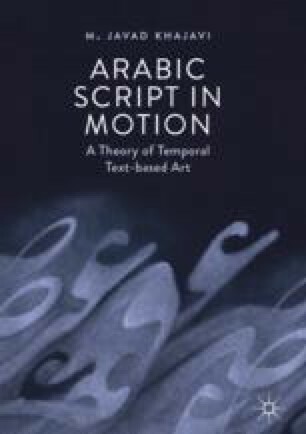 The focus of this chapter is on the plasmatic qualities of Arabic script and Islamic calligraphy. It is explained here that because of the script’s innate qualities Arabic letters and glyphs change shape constantly, according to their context. In addition, it is mentioned that the calligraphic line in Islamic calligraphy seems to be malleable. In fact, different examples of traditional calligraphy and neo-calligraphy render calligraphic forms as elastoplastic elements that can shift shape. These plasmatic qualities, as argued here, inspire a category of temporal events that are referred to here as plasmatic behaviors. In these, the shape of letters and glyphs may change but their identity and essence are preserved. So, although their shapes change, they still remain and can be recognized as the same verbal units. The chapter ends with a discussion of how plasmatic behaviors may affect legibility and readability.